Gil Hibben Black Triple Pro Throwing Knife Set With Nylon Sheath - Solid Piece Stainless Steel, Black Oxide Coated - 8 1/2" Length | BUDK.com - Knives & Swords At The Lowest Prices! The art of knife throwing is not something learned overnight. Not only does it require skill and techniques one can only learn from a professional, but it also requires the right knife. 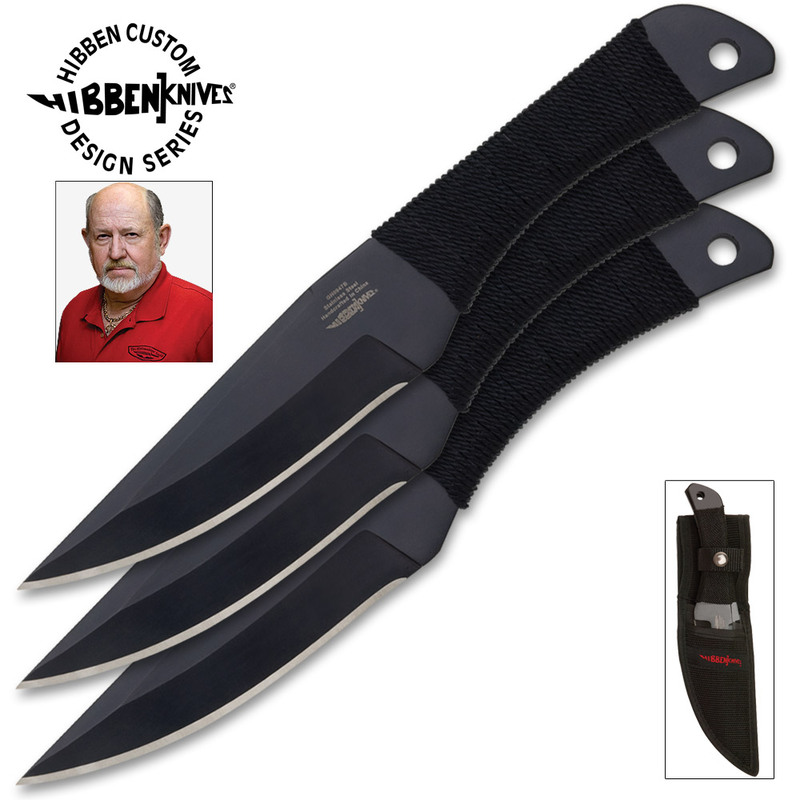 Gil Hibben, a supreme throwing knife master, designed these throwers for professional throwing accuracy. Each is constructed from one solid piece of stainless steel with a black oxide finish. 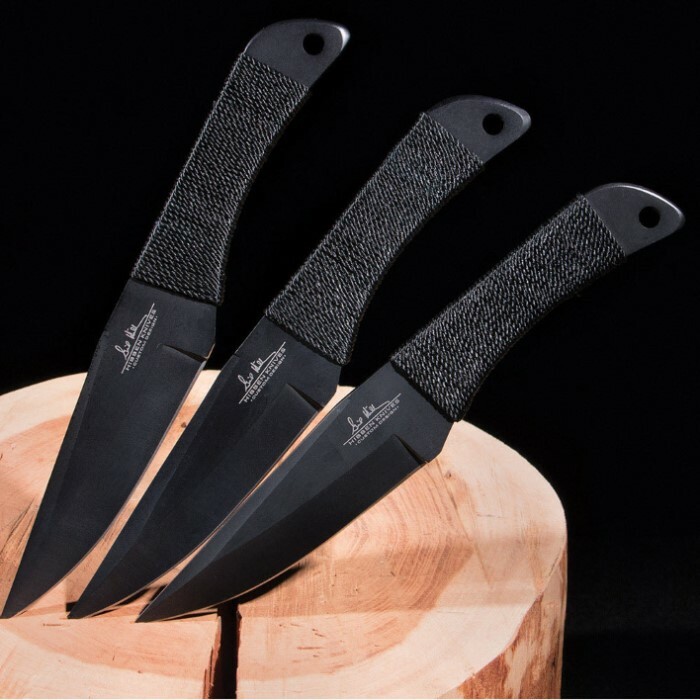 There are three knives in the set and each is 8 1/2" in overall length. A nylon sheath is included. Nice knifes , BUT they are very very sharp. you'll have to dull the sharpness down to use them. I got these the other day and used them that day. I've been throwing knives since I was a kid. These are great knives. I threw them hard and a lot. They're thick and well made. The only negative is the string wrapped on the handle. It started to come off after only a few throws. I took it off all of them and put black athletic tape on it like you would use on a baseball bat. Problem solved. At only $17, I'm buying another set. I've bought a few sets of theses and still have every one. The weight is good and the length is perfect. The cord does come off, especially when hit by another knife blade hitting it, but the cord is really not necessary for accurate throws. * A TIP * I taped mine with fluorescent thin width duct tape at the top and bottom of the cord wrap and it helps to slow the unwinding, but what's better is they are easier to see if they don't stick and easier to see in flight to judge your rotation and distance factors. The blade is pretty sharp out of the box, which some people like and some don’t on throwing knives. However, the tip is SO sharp that two blades bent after only a few fails, one at the tip and one at 1/3 away from the tip. Nothing that can’t be hammered out, but something to consider. Like other folks have said, the cord handle is worthless. Came off all three knives after 15 min of moderate throwing. Will be buying lots overtime great pieces love the work and making. A great set of knives. Once you get your throwing style down it's pretty fun. I'm a beginner, this is the second set of ball and I will stick with these for now just bought another set while they were on sale. The cord does come off that's expected. Knives do cut things. These are nice knives for the price. The cord comes off quick. You can throw them very hard, & they hold up. They stick good when thrown. The tip of the knives do stick through the case. All in all, I'm pleased. I have to say, these knives are great, especially for the price. I've been throwing them almost everyday for the past two weeks. These knives can really take a beating. While throwing the knives, they've dropped on rocks and even concrete and have not been damaged. The cord does come loose (mine did in the first hour of use). I happened to cut the cord off one knife while throwing another, like others have stated. The black oxide coating will eventually wear off in certain places (mine are beginning to wear off at the tip) but that is to be expected. Overall, the knives really hold up well and keep their point.